Apple, Inc. Earnings: Can the Tech Giant Live Up to a Higher Stock Price? With Apple's stock soaring lately, the pressure will be on when the company reports second-quarter results. Mark your calendar. Apple (NASDAQ:AAPL) has just set the date for its second-quarter results. On May 2, investors will get a timely glimpse into the company's recent performance. With Apple stock hitting new highs ahead of the earnings release, can the tech company live up to higher expectations from investors? Here are some key areas to watch when Apple reports its Q2 earnings early next month. Jet black iPhone 7 Plus. Image source: Apple. Will iPhone sales continue upward? After three quarters in a row of declining iPhone sales, the segment's revenue finally turned upward in the company's most recent quarter. iPhone unit sales and iPhone revenue were up 5% year over year in Apple's first quarter of fiscal 2017. Going into Apple's second quarter, investors will be looking for a similar trend in iPhone sales. Based on Apple's guidance for second-quarter revenue to be between $51.5 billion and $53.5 billion, management is likely expecting year-over-year growth in iPhone sales to persist during the quarter. This guidance implies overall revenue of about 3.4%, using the midpoint of Apple's guidance range, compared to Apple's $50.6 billion in revenue in the year-ago quarter. Considering that the iPhone accounted for 64% of Apple's trailing-12-month revenue, Apple's iPhone sales are a major determinant of the direction of the company's overall revenue, and thus a key determinant in management's guidance. Apple is expected to give investors an update on its capital return program alongside its second-quarter earnings release, as management has done in previous years. With the program consisting of both Apple's dividend and its share repurchase authorization, investors should look for management to update investors on both. As for Apple's dividend, investors should look for a dividend increase in the range of 8% to 15% -- in line with the company's dividend increases in the past four years. Perhaps even more important than Apple's dividend increase will be management's plans for share repurchases. Historically, Apple has opted to give more weight to share repurchases than dividends. Indeed, since the company initiated its dividend in 2012, Apple has spent $144 billion buying back its own shares and $51 billion paying dividends. However, with Apple stock rising about 25% in the past 12 months, it's possible that management will choose to give more emphasis to dividends than it has in the past. Another key area investors won't want to miss is Apple's guidance for its third quarter of fiscal 2017. With Apple only recently returning to revenue growth, the company's ability to grow its business is still in the spotlight. Apple's third quarter will be particularly interesting because, while Apple's iPhone 7 is still fairly new, the smartphone's overall form factor is several years old, dating back to the company's iPhone 6 launch in 2014. Will an aging iPhone design continue to drive growth for Apple? Further, investors will be looking to see if Apple's rapidly growing services segment can grow to represent an even larger portion of sales and, in turn, help Apple's overall revenue. 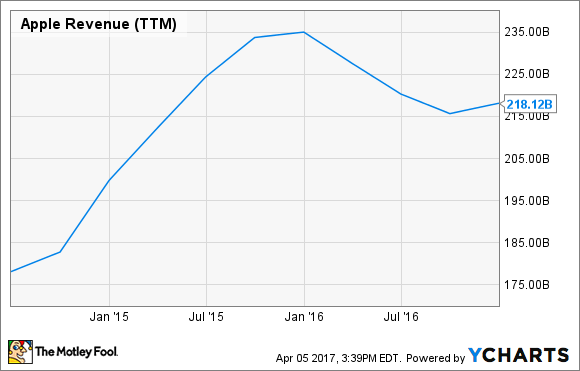 Based on how successful the iPhone 7 has been so far, and on the company's success with growing its services revenue, investors should expect Apple to guide for yet another quarter of year-over-year growth. Apple reports its second-quarter results after market close on May 2 and will host a live quarterly conference call to discuss results with analysts at 5:00 p.m. PST.